When identified, discrimination must be reported and corrected, often by using a complaint letter. 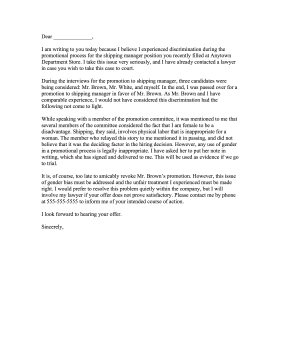 I am writing to you today because I believe I experienced discrimination during the promotional process for the shipping manager position you recently filled at Anytown Department Store. I take this issue very seriously, and I have already contacted a lawyer in case you wish to take this case to court. During the interviews for the promotion to shipping manager, three candidates were being considered: Mr. Brown, Mr. White, and myself. In the end, I was passed over for a promotion to shipping manager in favor of Mr. Brown. As Mr. Brown and I have comparable experience, I would not have considered this discrimination had the following not come to light. While speaking with a member of the promotion committee, it was mentioned to me that several members of the committee considered the fact that I am female to be a disadvantage. Shipping, they said, involves physical labor that is inappropriate for a woman. The member who relayed this story to me mentioned it in passing, and did not believe that it was the deciding factor in the hiring decision. However, any use of gender in a promotional process is legally inappropriate. I have asked her to put her note in writing, which she has signed and delivered to me. This will be used as evidence if we go to trial. It is, of course, too late to amicably revoke Mr. BrownÕs promotion. However, this issue of gender bias must be addressed and the unfair treatment I experienced must be made right. I would prefer to resolve this problem quietly within the company, but I will involve my lawyer if your offer does not prove satisfactory. Please contact me by phone at 555-555-5555 to inform me of your intended course of action. I look forward to hearing your offer.